A theory of change model, often referred to as a logic model, is one of the most common tools used to map out your specific community’s approach. It will not only document your theory of change for the TJC initiative but articulate to your TJC partners the rationale for actions or strategies. It guides your self-evaluation by identifying how resources and activities or programs are linked to desired outcomes. Your theory of change model will describe your TJC strategies and activities, and also help identify the data that should be collected by stating what measures will be used for its short- and long-term outcomes. A reentry council or criminal justice policy council, as well as each partnering agency, will typically develop its own theory of change model. The flow of the theory of change model begins with identifying the target population and ends with long-term outcomes. We’ve listed the headings most often used for each column. Offers a written rationale or a theory for selecting various strategies, programs, or intervention activities to implement the TJC initiative. Identifies the objective or change you hope will occur by implementing those various strategies, programs, or interventions to the population targeted. 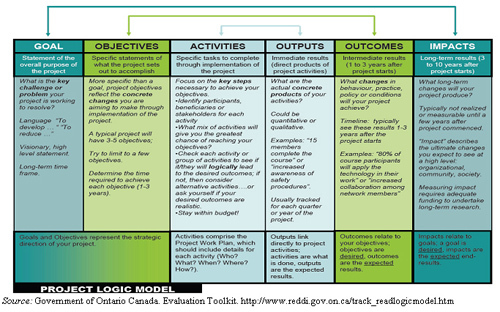 States the strategies, programs, and activities to be implemented (Activities in figure 2). Identifies the immediate, short-term outcome of the strategies, programs, or intervention activities (Outputs in figure 2). 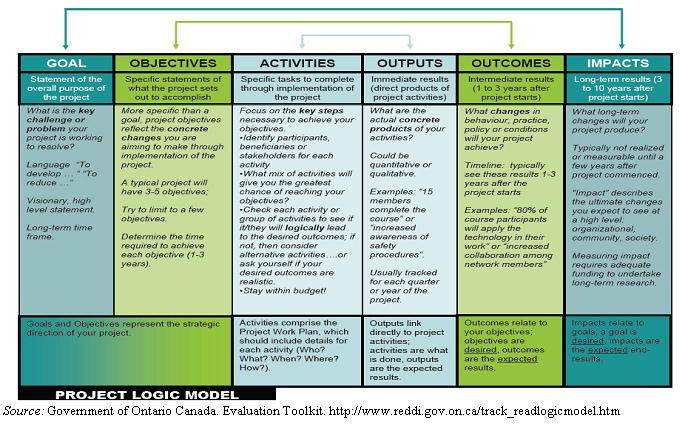 Identifies the intermediate outcomes of the strategies, programs, or intervention activities (Outcomes in figure 2). Identifies the final outcomes (long-term outcomes) of the strategies, programs, or intervention activities (Impact in figure 2). Developing a theory of change model is a group activity; it requires input from multiple stakeholders central to your community’s TJC initiative. Crafting a theory of change model begins by convening key stakeholders from the community and the jail to discuss and define the initiative’s goals and objectives, and the interventions or activities your community views as essential to achieving these goals and objectives. As discussed in module 4, a data-driven understanding of local reentry issues should inform many of these early discussions. A theory of change model, however, is only a first step. You will still need to define your key outcome measures, determine what data will be needed to measure these outcomes, decide how to collect and analyze the data, then do so, and report the results. See module 4 for more information on data collection and analysis.